The National Association of Professional Agents (NAPA) announced today the launch of a comprehensive Data Breach Compliance and Certification Program specifically designed for independent contractors, agencies and small businesses. With customer data under attack on a daily basis, consumers are increasingly concerned about the security and privacy of their personal information. It’s critically important for insurance producers and agencies to work proactively at preventing data breaches, maintaining compliance with state and federal data security regulations and demonstrating to clients that their personal information is properly protected. The National Association of Insurance Commissioners (NAIC) has released state regulation guidelines outlining professional standards for effective cybersecurity. A recent article* published on LifeHealthPro.com cited these guidelines and noted that even small producers can expect that they will need to comply with a minimum set of cybersecurity standards, develop incident response plans as described in the DOJ Best Practices, implement employee training programs, conduct a cybersecurity assessment and most importantly, provide evidence of these security measures. To assist independent contractors, agencies and small businesses in meeting these new guidelines, Gallagher MGA has partnered with INVISUS, an industry leader in data protection and risk management, to develop a comprehensive data security compliance and certification program for its members. The new program offers the InfoSafe® certification program which provides a simple and affordable way to ensure customer and employee data is protected and adheres to federal, state and industry data security and privacy regulations. InfoSafe® is a complete risk and compliance assessment program that includes implementation training and certification of best practices for protecting customer data as required in HIPAA-HITECH, GLBA, Red Flags, PCI-DSS, state ID theft protection laws and NAIC established guidelines. 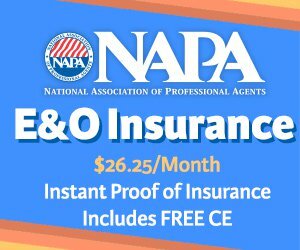 "This program is an indispensable tool for agents to enhance their professional brand, keep key clients and earn new ones," comments NAPA founder Lou Marinaccio. Once certified, agents and agencies can use the certification insignia on their website, business cards and client proposals. The program also offers the iCare Pro computer security and tech help desk service which includes unlimited access to U.S. based expert computer security and tech support services for one low monthly fee. To further support this initiative, NAPA also provides access to customized cyber liability insurance policy that provides not only defense against claims, but also data breach response services. "Reducing your risk and complying with state and federal laws is the first step to cybersecurity, but there is still no way to guarantee you won’t experience a breach. Even a small data breach can create significant financial loss, including the loss of current and future customers. In today’s world, it’s so important to safeguard your clients’ information as well as having a plan in place if you do experience a breach," says Marinaccio.